Maybe it’s a sign that I’m far too dependent on my pop culture, but I’ve been going a little stir crazy lately because the Olympics coverage has put all of my TV shows on hiatus. The polar vortex situation certainly isn’t helping either! But all this pining for a TV fix made me think about another show I want back soon: Doctor Who! If you watch the show, you know that Matt Smith, the previous actor who played the Doctor, left at the end of last season and is being replaced by Peter Capaldi, who will be the twelfth incarnation of the Doctor. Even though Season 8 of Doctor Who won’t air until July, there’s plenty of buzz about the new Doctor. And since we’re a fashion site, after all, there’s no better place than here to discuss the Doctor’s new costume. Each Doctor has had a signature outfit or accessory: for instance, Four had his gigantic striped scarf, Five had his celery brooch, Nine a tough leather jacket, Ten had his sweeping trench and trainers, and Eleven his bowties and fez. The first promo photos of Twelve were released last week; while this Doctor’s costume isn’t quite as dramatic or quirky as those of his predecessors, it’s really growing on me! It’s definitely back-to-basics, with a streamlined coat featuring a snazzy red lining, a cardigan vest, sleek trousers, and a pair of shiny boots. I can’t wait to see what direction they’re taking Capaldi’s Doctor… will he be a suave and dashing figure? Reserved? Irascible? Who knows?! I’ll be (anxiously) waiting until July to find out. 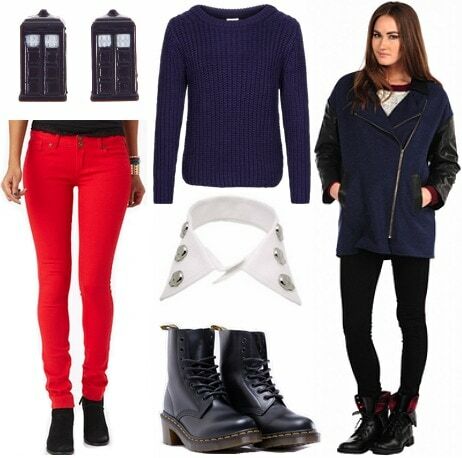 For more TARDIS-worthy outfit inspiration, check out previous Geek Chic articles: Fashion Inspired by Doctor Who: Part I, Fashion Inspired by Doctor Who: Part II, Fashion Inspired by Doctor Who: Part III, and Fashion Inspired by Clara from Doctor Who. Geronimo, fantastic, allons-y, what will the new catchphrase be? And what will the new Doctor be like? To bide the time until Season 8 begins, I’ve put together three outfits based on some of the Doctor’s defining traits, as well as Capaldi’s costume. Through all of this incarnations, one thing remains the same: the Doctor is, well, weird. (After all, he is an alien with two hearts who’s thousands of years old.) While we don’t know yet what new foibles the Twelfth Doctor will reveal – a fondness for bananas? Strange hats? Jelly babies? – he’ll definitely be as bizarrely fascinating as his predecessors. Channel the Doctor’s unique nature with this quirky-cool outfit featuring a pair of pleated shorts. 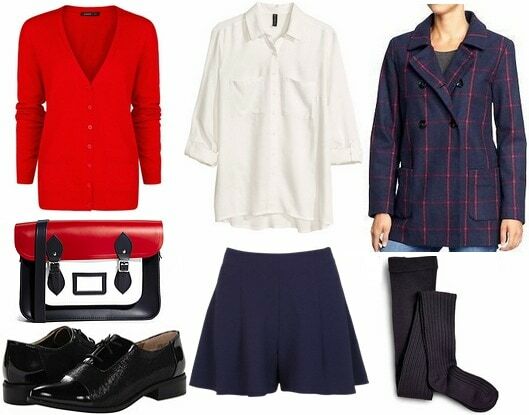 Add a bright cardigan and patent brogues, then slip on a fun plaid coat in what seem to be Twelve’s signature colors. Finally, a splurge-worthy color-blocked satchel is the perfect way to hold all your essentials while you’re zooming through all of time and space. 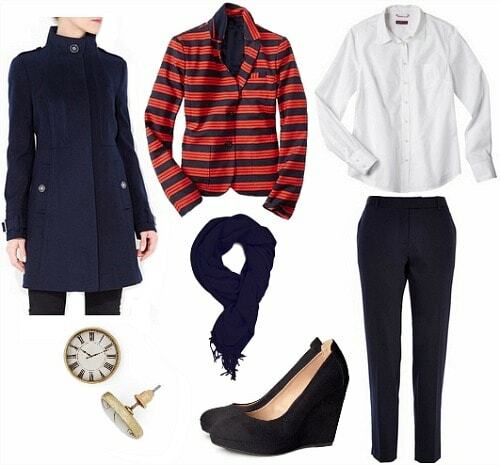 For a more classic look that reflects some of the Doctor’s more serious incarnations, try out a tailored ensemble featuring a striped red blazer and navy trousers resembling Twelve’s. You can never go wrong with a perfectly crisp white button-down shirt! A funnel-neck coat is a timeless piece you’ll be able to wear forever. Accessorize with polished pieces like wedge pumps, a solid-hued scarf, and stud earrings. Though he may be ancient by human standards, in his hearts the Doctor is still the adventurous boy who ran away to see the universe with his beloved TARDIS. Capture his rebellious nature with a slightly edgier ensemble featuring fire-engine red jeans and sturdy combat boots. Add some edge to your favorite basic sweater with an embellished collar, then slip on a mixed material moto jacket. You’ll feel ready to take on the universe! Would you wear these outfits? Are you excited for Peter Capaldi’s Doctor? What do you think of his costume? What other geeky inspirations would you like to see? Let me know in the comments!